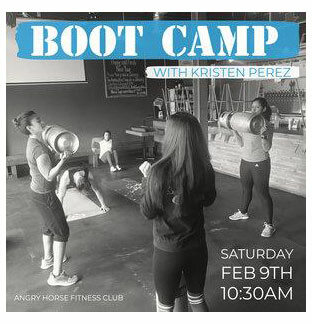 Join Angry Horse Fitness Club for our another Boot Camp workout with Kristen Perez at the taproom. Kristen will be bringing you a fun and fresh boot camp, focusing on exercises and techniques you can do anywhere. The bootcamp is free. All fitness levels and ages are welcome! The workout begins at 10:30AM. Bring your sneakers, your water bottle and a towel if you need it. If you have a mat, please bring that as well. Please plan to arrive 5-10 minutes early so we can start on time. Kristen Perez is a bikini pro and competition health coach. She loves strength training and has been competing since 2015, having recently medaled in 3 categories at the 3rd Annual IPL APEX Championships. Kristen believes that fitness should be a lifestyle, one that makes you the best version of yourself while still enjoying the things you love. Her focus on health and fitness has changed her life and is passionate about helping others learn how it can change theirs! After class, enjoy $1 off your first pint. Saturday, Feb. 9 @ 10:30 a.m.